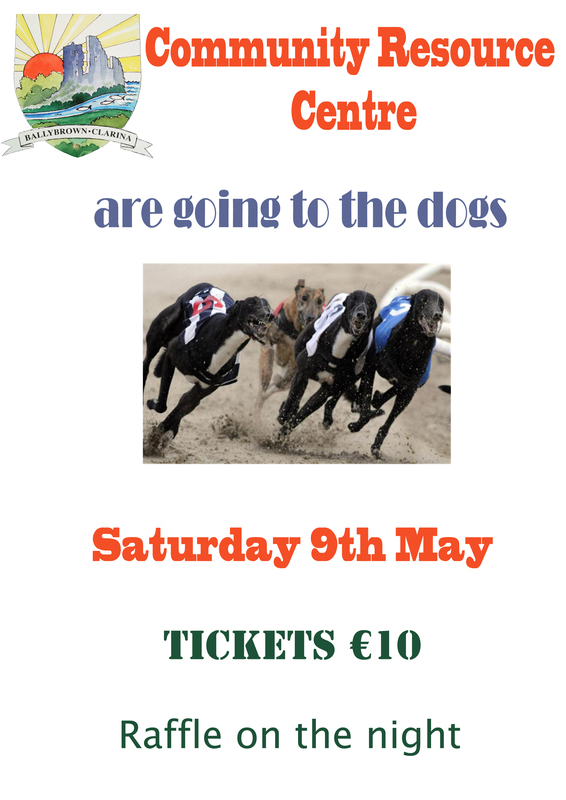 COMMUNITY RESOURCE CENTRE ARE GOING TO THE DOGS: Fundraising night at Limerick Greyhound Stadium on Saturday May 9. Gates open 6.30pm. First race 7.45pm. Tickets, including free raffle entry, are €10 and are available from the Resource Centre office or your local Community Council members. We’d love to see you there! 45 DRIVE: The weekly 45 card drive in aid of the Ballybrown Community Resource Centre continues each Thursday night at 8.45pm and your support would be greatly appreciated. On Thursday April 16th we had eleven tables and the prizes were as follows: 1st prize of €100 went to John Kiely with Billy Sheerin on 10 games. Second prize of €60 was divided between Billy Austin with Barney O’Brien and Richard Kennedy with Michael O’Kelly on 8 games. The table prize went to John Kiely and Billy Sheerin. The raffle prizes were as follows: 1/ €30, Billy Sheerin, 2/ €20, Marie Cregan, 3/ €20, May Doolan, 4/ €10, John O’Brien, 5/ €10, Susie Adams and 6/ €10, Gerry Moran. Pat Mulqueen and Donie Lane are still leading the league table on 62 games, while Bobby O’Connell is hot on their heels on 61, with Junior Hogan and Jimmy McNamara on 59 and Eithne Ryan, Billy Sheerin and Anthony McGann on 58. With just four weeks left in the league it is still wide open. Who will take that first prize of €150 on May 19th, with €80 for second place and €50 for third. Its all to play for, if your not in you can’t win. See you on Thursday night. Thanks to all our supporters. The new flowers are due to be planted outside the community resource centre shortly. they will certainly brighten up the outside of the centre. Flower planting will begin shortly as we are now coming into the summer months. More info coming soon…. such as the school and West Limerick Resources workers and photographs supplied showing joint work between these bodies were was great to see. The purchase of a ride-on mower with contributions from the local businesses was great to note. It is a good sign that you are supported across the business community. Note your adjudicator could not find an active FaceBook page for Clarina on-line although this was mentioned in your entry this year as a form of communication for your area. Your three-year plan could be more substantial and perhaps involve input from youth groups on one project or specific actions with reps from the various residential estates that is not related to litter picking. 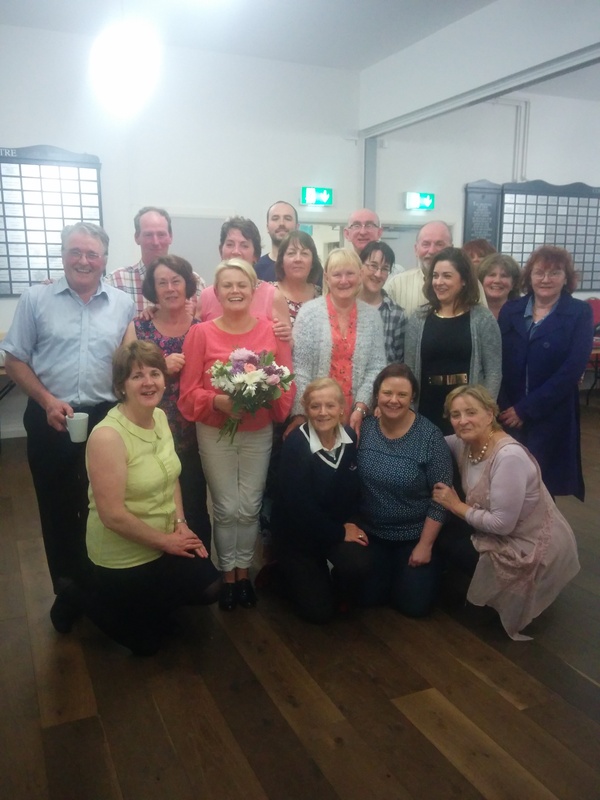 It was your adjudicator’s first time in Clarina and there are wonderful pockets through your community and you have worked hard to achieve an area of which to be proud. Kilkeedy cemetery was admired – what a lovely heritage building you have here. The rules of the graveyard are very dominantly displayed which was a bit of a shame where a nice welcome and nicely toned sign could have been displayed here. Can this sign be more discreetly placed? The newly opened Community Resource Centre looked excellent with the coat of arms presented nicely on the front gable. The school nearby also looked well. The large open concrete carpark by the western roundabout, and the stark boundary wall needs some softening with possible planting of ivy or honeysuckle. But it was lovely to see nice planters at Fifth Ave and the hair & beauty shop here giving a much needed lift to this area. Your adjudicator has concerns regarding the tin shed/ premises at the crossroads at the centre of the town that looks very precarious and could be a potential health & safety hazard. Approaching from the Limerick road the large raised bed looks very well. There are some bedding plants in planters at the western roundabout but they are small and low-level. It is suggested that maybe some shrubs are placed here to provide structure and form throughout the year and hopefully to also reduce the effort of planting and maintenance on the longer term. It is not until you stand above the landscaped bed at the Fisherman’s monument do you realise that it is in the shape of a boat. If slightly angled or raised this would look well to passing motorists. Your adjudicator was just delighted to see the field at the back road from the Fisherman’s monument full with yellow flag irises. All trees at the site for the Fisherman’s monument should have their stays removed as they are strong enough and the stays are now rubbing on the bark. No doubt the bat box at Kilmeedy cemetery will add to their natural habitat here. Your adjudicator was also impressed to know that you will be using your own compost in your landscaping schemes. It was good to read the details of the wildlife observed in your community. One suggestion would be to widen this to involve more within the community or to carry out a general habitat’s survey to determine how you can enhance the natural heritage of Clarina for the benefit of local biodiversity. Good to note you have maintained and repaired birdboxes. Have you had any residents in previous years? Perhaps you can collate this information or join in with some of the national surveys organised by BirdWatch Ireland? It was great to note you are re-using your bulbs and growing plants from seed. Have you considered involving a local green-fingered group in this particular aspect such as a local ICA group? Clarina is quite dispersed so your adjudicator wonders if there could be some provision made on the GAA road and the school road for cycling? There is potential to gain a lot of marks in this category of the competition so it is recommended you visit the TidyTowns website for ideas on how you can achieve points here or maybe you are hosting bring & buy sales or run book rental schemes already and you just need to tell us about such initiatives. The large garage on the main street should be congratulated as it presented very well despite the high volume of traffic in and out of here. No doubt as a result of the recent election, there were a lot of cable ties on the posts outside of the community centre and school. There were two large metal posts as you go into the grounds of the school that have no apparent use – perhaps they could be removed if this is correct? The bin beside the damaged monument on the back road by Hayes shop was full. There is quite a large aperture here in the bin so perhaps some of the litter is being deposited here illegally? You could prevent this by reducing the size of the aperture with cable ties or a secured piece of plastic. There was some litter in the New Village area. There is an old telegraph pole here that is no longer being used – can it be adapted to make a feature of this or could it be recycled? also benefitting wildlife too. Perhaps some honeysuckle or ivy could be planted to screen off this large area to the south better and provide a nicer view for the residents? It was good to see the nice wooden fence in the estate blocking off the unfinished houses here. who obviously didn’t realise there was a roundabout here!). Good to see use of planting at the base of the fencing here to screen off the road-side fencing at the unfinished estate. Well done to the matching planters outside the boundary walls of homes along Foynes Road. Hayes shop is a lovely little part of Clarina and presented very nicely and there was some nice planting in the area. What a pity the monument here has been damaged here. The road in front of the shop needs some potholes repaired. Likewise where you pull off this back road to access premises such as the school and community centre there are a lot of potholes and wear and tear on the road that needs to be addressed. The exterior wall of the GAA pitch is very harsh and it would be great to try and enhance this with planting of ivy or honey suckle or other climbers. Badminton continues each Monday Wednesday and Friday night in the Ballybrown GAA Clubhouse from 7pm to 10pm and new members are always welcome to get involved in this great indoor game. If you don’t have a racket don’t worry they are available on the night all you need is a pair of runners. Annual membership is available at €50 which represents great value in the present climate. Don’t miss the shuttle. Ballybrown 2-11 Mungret 2-14 Played in Claughaun on Sunday this was a game that had everything drama, excitement, skills aplenty, honest endeavour and ultimately heartbreak. Barry O Connor got us of to the perfect start with a point from play but Mungret came back at us and scored two goals and two points of their own. It looked like we were in trouble at this stage, and especially when we lost Mark Mulally through injury, but our lads dug in and kept themselves in the game. Two points from frees and then a magical minute from Luke O Connor when he scored 1-01 had us right back in the game. A point for Mungret from a sixty five finished the first half scoring with Mungret leading 2-03 to 1-04. Two early points from Mungret stretched out their lead but Ballybrown who were playing great stuff at this stage just kept hurling and points from Barry O Connor Aidan O Connor and Ethan Keyes set us up for a dramatic final few minutes. With time running out and we down by two points Aidan O Connor picked up the sliother and went on a solo run and from the 21 yard line blasted the ball to the back of the net, only to have the play called back for a free in, which Barry put over the bar to leave a single point in the game. From the puck out Ballybrown worked the ball back into the square where Cian Griffen was fouled and deep into injury time we had a penalty. Ballybrown opted to take the point and take the match to extra time and Cian slotted the ball over the bar to leave the game level at Ballybrown 1-10 Mungret 2-07. A long range free from Barry O Connor dropped into the square and Karl Buckley pounced to score a goal to put us three points up early in extra time, but with Ballybrown visably tiring Mungret clawed their way back and a point from Barry was our only other score in extra time. The Management, the Team and the Parents can be very proud of themselves they played themselves to a standstill against a much bigger and physically stronger Mungret team who had plenty of good hurlers of their own, and we wish them well in the final. Ballybrown Juvenile club once again held a very successful hurling camp over the Easter break with almost seventy youngsters taking part. The club would like to thank all the coaches, and the parents who helped out making sandwiches, parking, cleaning up and all the other little things that go into making it such a success. We would also like to thank Tom Morrissey and Barry Nash for turning up on the Friday to sign autographs and to offer words of advice to our young players. Ballybrown 1-22 Patrickswell 1-13 The semifinal of this years city championship was played in Mungret on Tuesday night with Ballybrown recording a nine point victory. Both teams were short players on the night but it is always nice to put one over on our fellow parishioners. Ballybrown now face Na Piarsaigh in the final. Our next outing is away to Doon in the league on Saturday 18th April at 6.45. Our Senior hurlers were away together for a few days and played two challenge matches against our friends from Faughs of Dublin and Loughgeale Shamrocks from Antrim who we played 25 years ago in the Allireland semifinal. Our lads won both matches and had a great couple of days together in the build up to this years championship. City intermediate hurling championship Ballybrown v Crecora on Sunday 19th April in Mungret at 6.30pm. The club bar has been given a face lift over the last few weeks and while all the work is not yet complete it has been an exciting time with all the help and advice along the way. Hopefully you will like the changes and apologies for the inconvenience caused. The Badminton continues every Monday Wednesday and Friday in the club and you are welcome to attend.